Gloria P. Zapata is a music educator with a master in Psycho pedagogy from Antioquia University (Medellin-Colombia) and a PhD in Music Psychology and Education from Roehampton University (U.K). Currently she works as a Research Coordinator of the School of Music at Fundación Universitaria Juan N. Corpas in Bogotá. She is the Chair of the Colombian Society of Researchers in Music Psychology and Education-PSICMUSE. She is member of the arts commission of IPRA and part of the advisory board of INRAE for the MONAES Project. 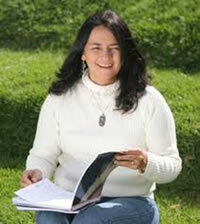 She has also worked as a consultant for the Ministry of Culture of Colombia and the Secretary of Culture of Bogotá. Her research interest focuses on the relationship between musical development, cultural context and education, which has led her to undertake several research projects in vulnerable communities and educational institutions affected by the Colombian conflict. Over more than 40 years of civil conflict in Colombia, Latin America’s second most populous country, government and guerrillas are now engaged in peace dialogues seeking for ways out from the conflict. This conflict has affected families and especially some of children´s self-identities and community process. Bearing in mind this state of affairs, this session will present the results of several research studies that had been undertaken in the cities of Medellín and Bogota (Colombia) in neighbours that have been affected by violence due to the conflict. The results of these research projects indicated that musical activities of family and cultural environment play a key role in children´s musical identities especially in music improvisation, showing that musical activities can improve resilience, family, community process and social transformation.